Generally speaking, I’m a homebody. I can spend the entire weekend on the couch, listening to music, watching TV, wasting time on my laptop… capped off by a nice nap after lunch. But if I’ve been in the house too long, I start to get a little frantic. 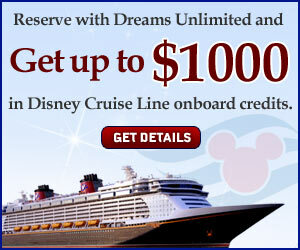 Such was the case the week of the devastating Hurricane Sandy. Like most New Yorkers/New Jerseyites (is that what we’re called? ), I didn’t expect much from the storm. The weather outlets had cried wolf so many times that I expected a heavy rainstorm at the most. On Monday, I went to CVS and stocked up on Halloween candy, for the deluge of trick-or-treaters I hoped to receive. I made goody bags as the storm rolled in. We all know what happened. I won’t go into any of that here, because this isn’t the place for it. All I can say is we were incredibly lucky. We didn’t sustain any damage, we didn’t lose power, and we didn’t even lose cable or internet access. My office lost power, and my boyfriend’s office in lower Manhattan was completely inaccessible (and still is), so we were both home for the entire week. Literally home, as neither of us had thought to gas up our cars, and had about ¼ tank each. We figured we’d better save the little fuel we had, just in case. We pretty much cleared out the ‘fridge that week, eating whatever we had in the house – cold cuts, frozen burritos, chicken… We’re usually pretty well-stocked, but it started getting boring, eating the same things over and over again. And speaking of boring, I was becoming stir-crazy being in the house that long. To my surprise, there’s only so much TV one can watch. By Saturday, my boredom peaked. I wanted to go out so badly that I could feel it in my skin. The week before the storm, I got an email from one of our favorite local haunts, Zinburger, detailing their new menu items. I showed it to my boyfriend, and he said “Let’s go next week”, never thinking we’d be house-bound (thanks to the storm, the lack of fuel, and the fact that he’d been sick for several days). And that conversation was still in my head 10 days later, as my feeling of restlessness grew. Zinburger is only about a mile from our apartment, so wasting gas wasn’t a concern. Usually, this place is very crowded, and waiting a little while for a table is commonplace – even on a weeknight. This was a Saturday, and there were plenty of available tables. We were seated and greeted immediately. I ordered a glass of Educated Guess Cabernet Sauvignon. 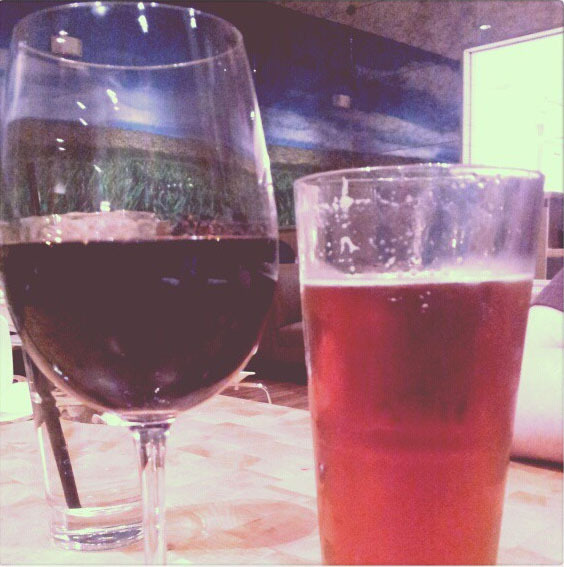 At $12 a glass, it’s not a bargain, but it’s the best cab they have on the menu, and I was absolutely craving it. 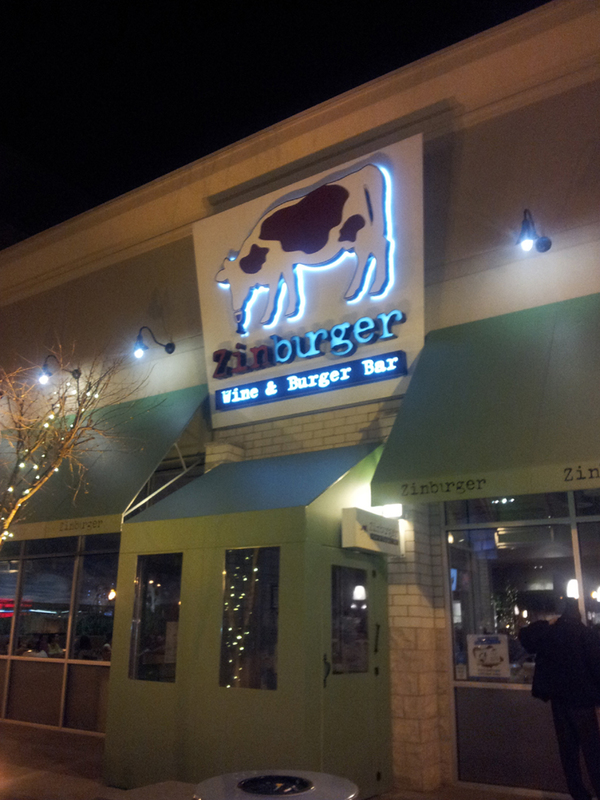 I never thought of wine and hamburgers pairing well, but Zinburger proved me wrong. Dan ordered a 20 oz. Sam Adams ($6). One sip, and I was instantly relaxed. I knew exactly what I wanted to eat before we even left the house. New to the menu, The Double ($10) is described as “Double patty, double American cheese, minced onion, lettuce, and mayo”. I’m not a mayo-on-burgers kind of girl, so I asked them to hold that – more room for ketchup! I ordered my burger medium-well. I’ll eat a good steak almost raw, but ground beef has to be cooked. This burger was perfect. The patties were smaller, 3 oz. patties (as you would probably expect from a double cheeseburger), but the quality of the beef was no different than any of the other burgers I’ve had here. Zinburger offers both Certified Angus, and American-style Kobe (since real Japanese Kobe beef is near impossible to get in America due to strict import laws. Yes, all those menu-writers have been lying to you!). Dan ordered another new item, The Ringer ($11). This is Nueske’s Applewood Smoked Bacon, Frank’s Hot Onion Rings, Pepperjack cheese, and mayo. I didn’t taste his because he ordered it medium-rare, and much to his delight, it was somewhat undercooked. No thanks – I don’t eat things that look like brains. He gave it two thumbs-up, though. Good beef and good spiciness. The burger buns always have a kind of sheen to them, but they’re not at all greasy. I’m not quite sure what they brush them with, but it doesn’t add to or detract from the flavor of the burgers at all. Our accompaniments, sold a la carte, were the Double Truffle fries (with truffle aioli and truffle oil), and the new Onion Rings, served with BBQ sauce ($6 each). The way they handle sides at Zinburger is, they bring them out whenever they’re ready – so you will get your fries or rings before your burgers, without fail. They are good-sized portions, so they kind of act as both appetizers and side dishes. 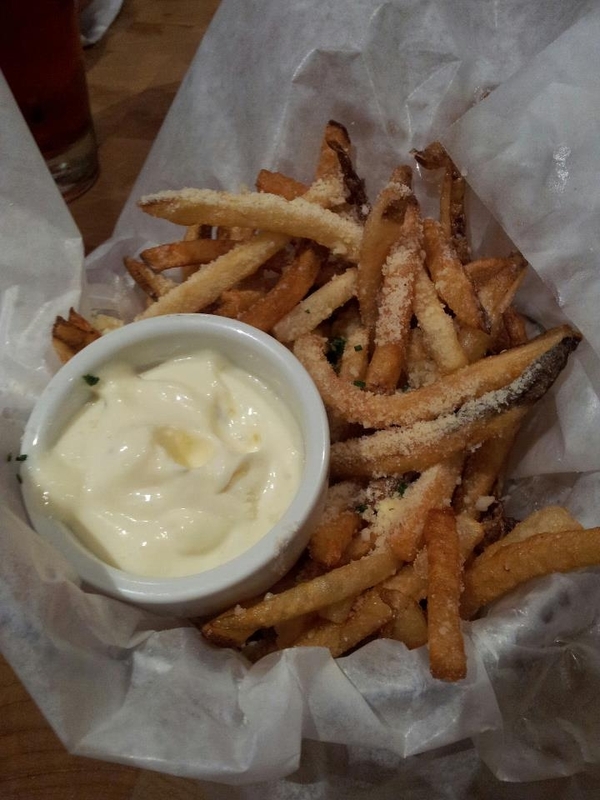 The fries are never as crispy as I would like, but the truffle oil and grated cheese more than make up for that. It’s really hard to go wrong with truffle anything! 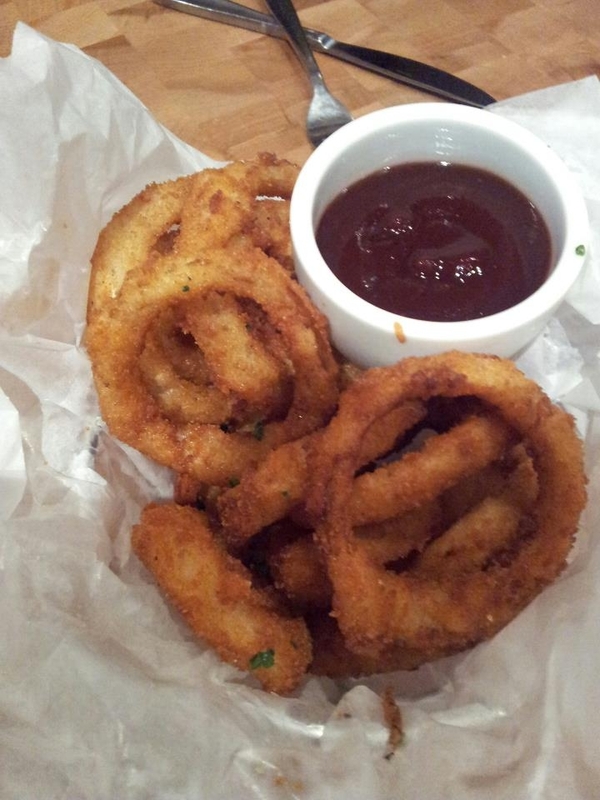 The new onion rings were cooked perfectly – nice crispy batter, with minced onions inside. The barbeque sauce was yummy – not too smoky, and not too sweet – but I prefer my onion rings either plain or with ketchup (again with the ketchup!). 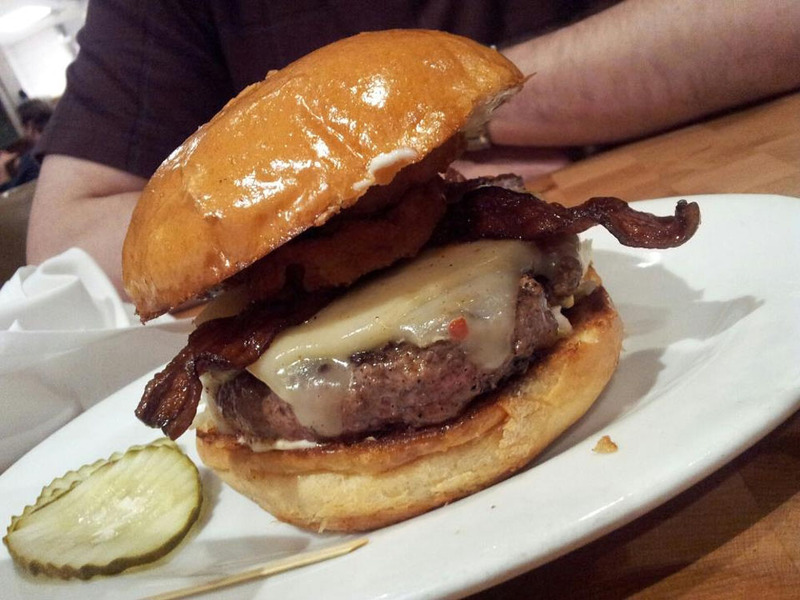 Zinburger’s menu boasts a variety of salads, milkshakes, pies, and other appetizing offerings. The atmosphere is casual but sleek, with cow and blue sky wall paper, and contemporary wood-and-steel detail. Good service, too. This was a wonderful meal. Just being out of the house after a week was wonderful, but the food was really delicious. 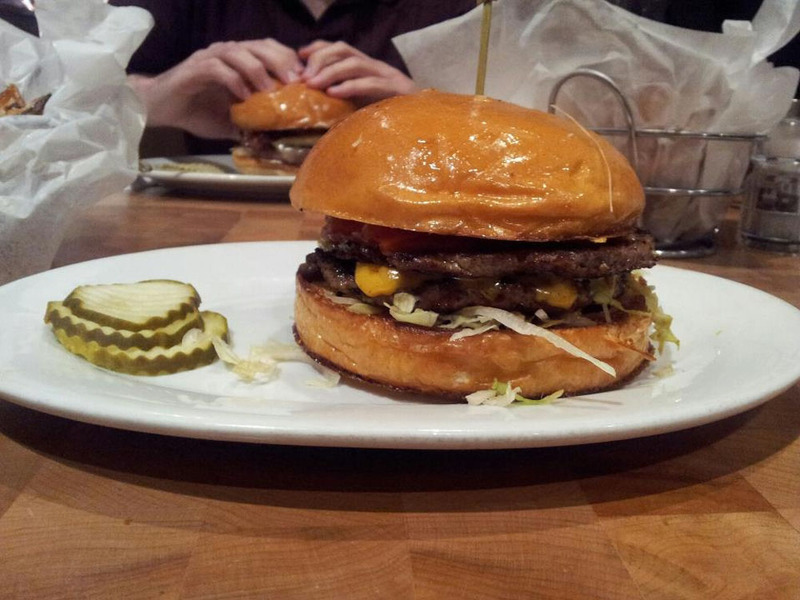 This wasn’t our first time at Zinburger, and it won’t be our last. This entry was posted in Eat Like a Local and tagged American cheese, American-style Kobe, Applewood Smoked Bacon, Cabernet Sauvignon, Certified Angus, cheeseburger, Clifton, Clifton New Jersey, double cheeseburger, Educated Guess Cabernet Sauvignon, Hamburger, lettuce, mayo, minced onion, Onion Rings, Pepperjack cheese, Sam Adams, The Double, The Ringer, truffle, truffle aioli, Truffle fries, Zingburger by Gillian Smith. Bookmark the permalink. Really great writing! Thanks and I’ll have to look for that Cab -we’re always looking for a decent, moderately-priced Napa Cab to keep around the house. Thank you so much! Educated Guess is probably about 15-20 bucks in the store, and it’s a pretty good one. Big cab fan here!